Spirit Wear Store Now Open for Football and Cheer!!! In order to make a lot of the changes that we’re looking to do this year, we are going to need more financial support than we’ve ever received. Unfortunately, registrations fees alone aren’t enough to cover the full cost of the program – especially in a year like 2016 where we are replacing uniforms for both football players and cheerleaders. Many other clubs overcome these shortfalls by requiring players to do significant fundraising. We know that many times the burden of fundraising ultimately falls on the parents – who in many cases are already over-booked. Therefore, our hope is to be able secure the funds we need via sponsorship and donations and relieve parents of that burden. There are four primary ways to contribute to the Wildcats (sponsorship and corporate-matching/check/credit card donations). To the extent possible, we hope you’ll consider supporting the Wildcats in at least one of these four ways and that you’ll pass this email along to anyone you know who you think may be interested in supporting us. Our Business sponsorship program that will not only give Businesses an opportunity to support the Wildcats but we believe that it will also provide them with a lot of marketing value that is hard to come by in this area. There are several packages that include various combinations of field banners, ads in our Game Day Program, logos on our website, etc. Note that there is one special package that is only available to the parents of a Wildcat called “The Wildcat”. If your employer is willing to sponsor the Wildcats for $1,000, not only will they receive a valuable marketing package from the Wildcats, but your child will also get a free registration. Please contact Matt Hepworth at mdhepworth1@gmail.com for more information. 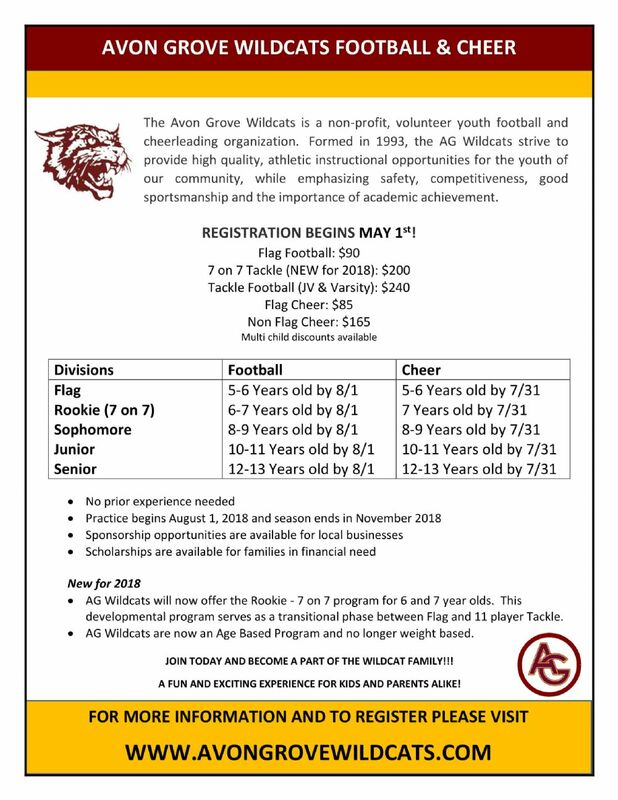 To support the Wildcats with a check donation, please make the check out to the “Avon Grove Wildcats” and mail it to PO Box 103, West Grove, PA 19390. You can also hand a check to Elsje Kumpon or myself in person. In order to make a credit card donation in $25 increments, simply go to www.avongrovewildcats.com and go to the “Online Donations” link on the left hand panel. You can also go there directly by clicking here: http://avongrovewildcats.com/Store/Item.asp?id=18991&n=&org=avongrovewildcats.com. There are several corporate programs that allow employees to contribute to a non-profit organization where the company then matches the donation amount. Organizations like Bank of America and United Way participate in programs like this. If your company offers this type of program, please consider selecting the Wildcats as an organization that you support. If you would like any information regarding the responsibilities of any above position or you are interested in any of these positions, please email .